Vinod Khosla (Gurmukhi: ???"?? -"????) (born 28 January 1955) is an Indian-American businessman and venture capitalist. 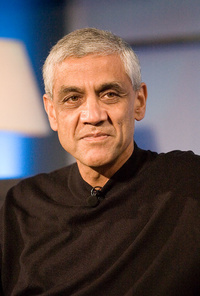 Khosla was one of the co-founders of Sun Microsystems, and served as its first CEO and Chairman in the early 1980s. In 1986, he became a general partner of the venture capital firm Kleiner Perkins Caufield & Byers, where he remained through the early 2000s. In 2004 Khosla formed his own firm, Khosla Ventures, which focused on venture investments in various technology sectors, most notably clean technology. He is a strong supporter of clean technology and said "If it doesn't scale, it doesn't matter. Most of what we talk about today"?hybrid, biodiesel, ethanol, solar photovoltaics, geothermal"?I believe are irrelevant to the scale of the problem." This webpage uses material from the Wikipedia article "Vinod_Khosla" and is licensed under the GNU Free Documentation License. Reality TV World is not responsible for any errors or omissions the Wikipedia article may contain.